Jerold S. Bell, DVM, is an adjunct professor of genetics at Cummings School of Veterinary Medicine at Tufts University. 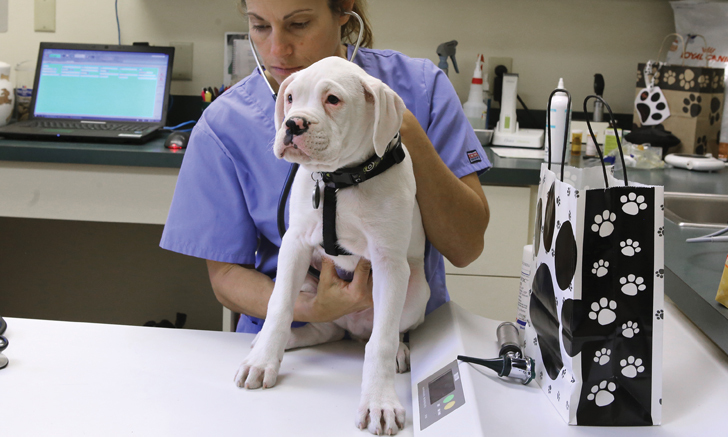 He also practices at Freshwater Veterinary Hospital in Enfield, Connecticut. He earned his DVM from Cornell University and was trained in genetics and genetic counseling at Michigan State University and University of Missouri. Dr. Bell serves on the WSAVA hereditary diseases committee, the board of directors for the Orthopedic Foundation for Animals, and the American Kennel Club Canine Health & Welfare advisory panel. The hallmark of inherited disease is predictability of onset and progression. Recognizing predictable triggers and modifying factors that influence the expression of genetic disorders can help improve diagnosis, treatment, and control. No genetic-liability tests are available. Predictable seasonality can be recognized in 15% to 62% (median, 30%) of allergic dogs with chronic presentations.7 For these patients, interventional measures to manage pruritus should be prescribed before it progresses to clinical disease. Dogs affected by genetic disorders should not be selected for breeding. Because most of these genetic diseases are complexly inherited, genetic risk for carrying disease-liability genes should be based on knowledge of clinical disease or normalcy in first-degree relatives of prospective breeding dogs. Oberbauer AM, Belanger JM, Bellumori T, Bannasch DL, Famula TR. Ten inherited disorders in purebred dogs by functional breed groupings. Canine Genet Epidemiol. 2015;2:9. Egenvall A, Bonnett BN, Olson P, Hedhammer A. Gender, age and breed pattern of diagnoses for veterinary care in insured dogs in Sweden during 1996. Vet Rec. 2000;146(19):551-557. Top 10 reasons pets visit vets. Nationwide website. http://www.petinsurance.com/healthzone/pet-articles/pet-health/Top-10-Reasons-Pets-Visit-Vets.aspx. Accessed July 1, 2016. O’Neill DG, Church DB, McGreevy PD, Thomson PC, Brodbelt DC. Prevalence of disorders recorded in dogs attending primary-care veterinary practices in England. PLoS One. 2014;9(3):e90501. State of Pet Health 2016 Report. Banfield Pet Hospital website. https://www.banfield.com/Banfield/media/PDF/Downloads/soph/Banfield-State-of-Pet-Health-Report-2016.pdf. Accessed July 1, 2016. Bellumori TP, Famula TR, Bannasch DL, Belanger JM, Oberbauer AM. Prevalence of inherited disorders among mixed-breed and purebred dogs: 27,254 cases (1995-2010). J Am Vet Med Assoc. 2013;242(11):1549-1555. Mazrier H, Vogelnest LJ, Thomson PC, Taylor RM, Williamson P. Canine atopic dermatitis: breed risk in Australia and evidence for a susceptible clade. Vet Dermatol. 2016;27(3):167-e42. Bizikova P, Santoro D, Marsella R, Nuttall T, Eisenschenk MN, Pucheu-Haston CM. Review: clinical and histological manifestations of canine atopic dermatitis. Vet Dermatol. 2015;26(2):79-e24. Shaw SC, Wood JL, Freeman J, Littlewood JD, Hannant D. Estimation of heritability of atopic dermatitis in Labrador and golden retrievers. Am J Vet Res. 2004;65(7):1014-1020. Tengvall K, Kierczak M, Bergvall K, et al. Genome-wide analysis in German shepherd dogs reveals association of a locus on CFA 27 with atopic dermatitis. PLoS Genet. 2013;9(5):e1003475. Orthopedic Foundation for Animals. OFA website. http://www.ofa.org. Accessed July 1, 2016. Verhoeven G, Fortrie R, Van Ryssen B, Coopman F. Worldwide screening for canine hip dysplasia: where are we now? Vet Surg. 2012;41(1):10-19. Gatineau M, Dupuis J, Beauregard G, et al. Palpation and dorsal acetabular rim radiographic projection for early detection of canine hip dysplasia: a prospective study. Vet Surg. 2012;41(1):42-53. Sánchez-Molano E, Pong-Wong R, Clements DN, Blott SC, Wiener P, Woolliams JA. Genomic prediction of traits related to canine hip dysplasia. Front Genet. 2015;6:97. Keller GG, Dziuk E, Bell JS. How the Orthopedic Foundation for Animals (OFA) is tackling inherited disorders in the USA: using hip and elbow dysplasia as examples. Vet J. 2011;189(2): 197-202. Dupré G, Heidenreich D. Brachycephalic syndrome. Vet Clin North Am Small Anim Pract. 2016;46(4):691-707. Smith S. Most popular dog breeds in America. American Kennel Club website. http://www.akc.org/news/the-most-popular-dog-breeds-in-america. Published February 22, 2016. Accessed July 1, 2016. Packer RMA, Hendricks A, Tivers MS, Burn CC. Impact of facial conformation on canine health: brachycephalic obstructive airway syndrome. PLoS One. 2015;10(10): e0137496. O’Neill DG, Jackson C, Guy JH, et al. 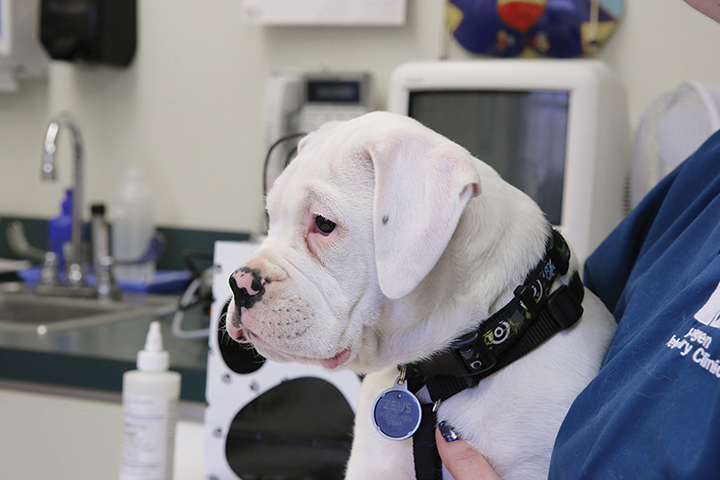 Epidemiological associations between brachycephaly and upper respiratory tract disorders in dogs attending veterinary practices in England. Canine Genet Epidemiol. 2015;2:10. Meola SD. Brachycephalic airway syndrome. Top Companion Anim Med. 2013;28(3):91-96. Mattin MJ, Boswood A, Church DB, et al. Prevalence of and risk factors for degenerative mitral valve disease in dogs attending primary-care veterinary practices in England. J Vet Intern Med. 2015;29(3):847-854. Parker HG, Kilroy-Glynn P. Myxomatous mitral valve disease in dogs: does size matter? J Vet Cardiol. 2012;14(1):19-29. Lewis T, Swift S, Woolliams JA, Blott S. Heritability of premature mitral valve disease in Cavalier King Charles spaniels. Vet J. 2011;188(1):73-76. Birkegård AC, Reimann MJ, Martinussen T, Häggström J, Pedersen HD, Olsen LH. Breeding restrictions decrease the prevalence of myxomatous mitral valve disease in Cavalier King Charles spaniels over an 8- to 10-year period. J Vet Intern Med. 2016;30(1):63-68. Taylor-Brown FE, Meeson RL, Brodbelt DC, et al. Epidemiology of cranial cruciate ligament disease diagnosis in dogs attending primary-care veterinary practices in England. Vet Surg. 2015;44(6):777-783. Wilke VL, Conzemius MG, Kinghorn BP, Macrossan PE, Cai W, Rothschild MF. Inheritance of rupture of the cranial cruciate ligament in Newfoundlands. J Am Vet Med Assoc. 2006;228(1): 61-64. Baird AE, Carter SD, Innes JF, Ollier W, Short A. Genome-wide association study identifies genomic regions of association for cruciate ligament rupture in Newfoundland dogs. Anim Genet. 2014;45(4):542-549. Comerford EJ, Smith K, Hayashi K. Update on the aetiopathogenesis of canine cranial cruciate ligament disease. Vet Comp Orthop Traumatol. 2011;24(2):91-98. Slutsky J, Raj K, Yuhnke S, et al. A web resource on DNA tests for canine and feline hereditary diseases. Vet J. 2013;197(2): 182-187. Mellersh C. DNA testing and domestic dogs. Mamm Genome. 2012;23(1-2):109-123. Earn up to 34.5 hours of RACE-approved CE with Clinician’s Brief content.